Any dive can be ruined when your scuba dive mask fogs up and you don’t have a clear view under water. Especially new masks are prone to fogging up during the first few dives. However, even older masks can and will fog up at times. The most common remedy for a foggy mask is spit. There are also many other commercial as well as home remedies available in case you don’t want to spit into your mask. Why does a mask fog up? Let’s have a look at what happens when a dive or snorkel mask fogs up. Basically, you have condensation occur on the inside of your mask. The trapped air inside the mask is humid and when it hits the colder glass of your lens it starts to condensate. It’s the same effect if you drive with your air-conditioned car when it’s really humid and warm outside. If you don’t blow the air onto the windshield, it fogs up. The more humid the air that is trapped inside the mask, the higher the chances that you experience it fogging up. Other factors are the water temperature and certainly the cleanness of your lens. Condensation happens on a microscopic level. It is dependent on the surface tension of the lens I addition to the two factors mentioned above. Defogger solutions as well as spit reduce that surface tension which in turn reduces the chances of fogging in your mask. No matter which of the solutions you use to keep your mask from﻿ fogging up, make sure that the lens is clean and that your fingers are dry and clean. Dirt in the mask only helps the fogging. New dive and snorkel masks have a silicone coating left on the lens. This coating comes from the production process and if not completely removed will pretty much guarantee that the mask fogs up. It won’t even matter what other anti-fog solutions you try, as long as this silicone coating is on the glass you’ll fog up. It’s important for that reason to get rid of any trace of the silicone before diving or snorkeling. There are a few ways that you can use to remove the layer. Distribute a good amount of non-bleaching toothpaste with your finger all over the glass. Leave it on overnight. Then wipe it off with a soft cloth or wash it off. This will remove the left-over silicone coating from the glass. You can even use toothpaste as an ongoing anti-fog solution for your mask. The second way to get rid of the silicone coating is to burn it off. For that you simply run the flame of a candle or of a lighter over the lens. This burns the silicone off and leaves a black layer of burnt silicone. Wipe it off with a soft cloth. You might have to repeat this procedure a few times until there’s no black layer left after you treated the lens with the flame. You want to be very careful when you choose to use this method. If you’re not careful you might end up burning the silicone of the skirt and you can end up with a ruined mask. Also, if the lens is made of plastic then it will melt! Once a scuba mask has been used for a few dives you need to think of different solutions to keep it from fogging up. Take a few drops of baby shampoo and rub them onto your lens. You can also mix the baby shampoo with water and have it in a small spray bottle. Rinse just before you dive and you should not experience any fogging. You could use regular shampoo instead. However, if during the dive you get water into the mask and then into your eyes, then the regular shampoo might sting. Baby shampoos are formulated to not cause tears and as such work better. A word of caution. Do not dump the baby shampoo and water solution onto the deck after you rinse out your mask. It might make the deck slippery as the shampoo is like soap! The cheapest solution of all. Simply spit into the dry mask and rub the spit all over the lens. Then briefly rinse the mask out with fresh or salt water. Some divers don’t like this solution as it simply grosses them out. A downside is also that the spit anti-fog doesn’t last very long. You’ll have to redo the same procedure before every dive. One safety measure you must consider when using spit. Never ever spit into your mask and then use the rinse bucket on the dive boat! If only one of you divers is sick, the virus or bacteria will contaminate the water in the rinse bucket and expose other divers to it. Only use the rinse bucket for commercial anti-fog solutions or for whatever method the dive boat provides! You’ll find quite a few different commercial de-foggers for scuba masks. These all work pretty well and are quite affordable. Some of them come in convenient spray bottles which makes it easy to apply them. Others simply need a drop of the liquid in the mask. Simply spray or drip them into the mask and rub the solution all over the lens. Make sure that you don’t have any sunscreen or lotion residue on your fingers when distributing the anti-fog on your lens! Rinse in fresh or salt water and you should be good to go. Another advantage of these solutions is that they usually last for more than one dive so you don’t have to reapply them after each dive. The solution that is most often used is the cheapest one. Use your spit. 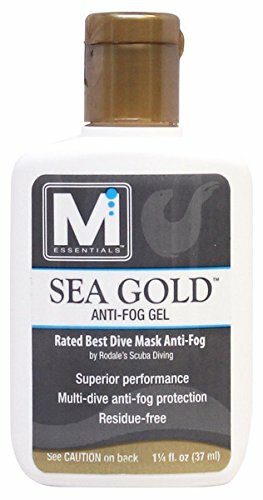 If that’s too disgusting or if you want to simply not have to use a method every time you dive then switch to commercial mask de-foggers.